State civil forfeiture laws vary in terms of how easy—and how rewarding—they make forfeiture for law enforcement, but state and local law enforcement agencies have another means of forfeiting property and getting a cut: the federal government’s equitable sharing program. Through equitable sharing, property seized locally can be forfeited federally. Equitable sharing can happen in one of two ways. First, state and local agencies can turn property they seize over to a federal agency, which can elect to “adopt” it for federal forfeiture if the “conduct giving rise to the seizure is in violation of federal law and where federal law provides for forfeiture.”1 Federal rules announced in 2015 limit adoptive forfeitures, though exceptions remain. Alternatively, state and local officers working as part of a joint task force or investigation with the federal government can make seizures that are eligible for equitable sharing. Either way, cash and property seized by state and local law enforcement becomes subject to federal civil forfeiture law—not state law. Through equitable sharing, up to 80 percent of proceeds can be returned to, or “shared” with, state and local agencies, with the federal government retaining the remainder. As with civil forfeiture under the laws of most states, no charges or convictions are required. The same 1984 amendments that created the Assets Forfeiture Fund, introducing a financial incentive to federal forfeiture law, also gave rise to equitable sharing,2 and its use has exploded. 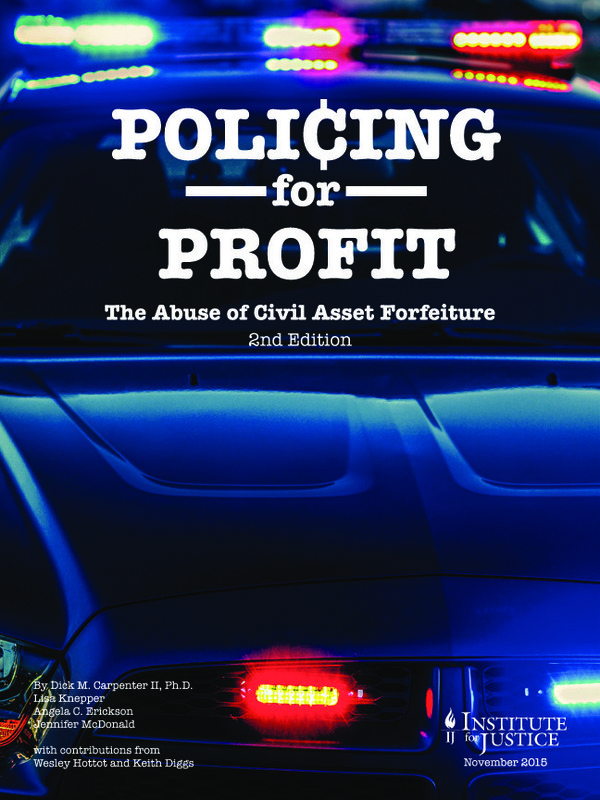 In 2014, more than 3,000 state and local law enforcement agencies received forfeiture proceeds through the Department of Justice’s equitable sharing program, a 17 percent increase from 2004.3 Between 2000 and 2013, annual payments to state and local law enforcement through the DOJ’s program more than tripled,4 growing from $199 million to $643 million, as shown in Table 2 and Figure 10. The Treasury Department maintains a smaller equitable sharing program; its payments rose about 45 percent over the same time period, from $85 million to $124 million.5 In all, the Justice Department’s equitable sharing program generated $4.7 billion for state and local agencies from 2000 to 2013, while the Treasury Department’s program accounted for $1.1 billion in payments. Source: Institute for Justice analysis of DOJ civil and criminal forfeiture data obtained by FOIA. Table 3 ranks states and the District of Columbia according to their law enforcement agencies’ use of the Department of Justice’s equitable sharing program. Rankings reflect average annual equitable sharing payments from the DOJ from 2011 to 2013. The averages are adjusted to account for drug arrest rates, since states with more drug crimes will presumably participate more extensively in equitable sharing. South Dakota, North Dakota and Wyoming top the list as the states with the lowest levels of equitable sharing payments. Agencies in California and Rhode Island, ranked 50th and 51st, take advantage of equitable sharing far more frequently than do agencies elsewhere. *Effective October 2018, adoptions will be banned in the District of Columbia and proceeds from joint task force and investigative seizures will be directed to the city’s general fund. **As of July 2015, law enforcement agencies in New Mexico are prohibited from transferring property worth less than $50,000 to the federal government for forfeiture and all proceeds are directed to the state’s general fund. Sources: Institute for Justice analysis of DOJ civil and criminal forfeiture data (average annual DOJ equitable sharing payments, 2011–2013); FBI Uniform Crime Reports (state drug arrest rates, 2011–2013). The Department of Justice claims that equitable sharing, like civil forfeiture more generally, helps deter crime and provides “valuable additional resources to state and local law enforcement agencies.”6 Equitable sharing is also said to promote cooperation among federal, state and local law enforcement.7 With joint task forces and investigations, equitable sharing allows the federal government to act as a central processor for potentially complicated seizures involving multiple agencies across different jurisdictions and then distribute proceeds according to each agency’s contribution. Equitable sharing offers other advantages for state and local law enforcement. While some states demand a relatively high standard of proof that seized property is connected to a crime—with a growing number now requiring a criminal conviction—federal law requires only a preponderance of the evidence.12 Likewise, while a handful of states put the burden on the government in innocent owner claims, the federal government forces owners to prove that they neither knew about nor consented to a suspected illegal use of their property.13 Such procedural differences can make forfeiting property under federal law substantially easier than forfeiting it under state law. In August 2012, Anaheim police teamed up with federal prosecutors and used equitable sharing to seize Jalali’s building under federal civil forfeiture law. The Institute for Justice took up Jalali’s case, and, after more than a year of fighting in federal court, the government finally agreed to drop the forfeiture.16 But had it succeeded, Anaheim police could have received up to 80 percent of the proceeds of Jalali’s property, valued at $1.5 million17—funds they could never have received under state law. Given California’s relatively restrictive civil forfeiture laws, the state’s poor ranking on equitable sharing—50th out of the 50 states and the District of Columbia—underscores the circumvention risks the practice poses. Likewise, North Carolina requires a conviction for most civil forfeitures and directs proceeds to public schools, earning the state a B+ for its laws, yet it ranks 42nd for equitable sharing. New York, Indiana and Missouri all receive higher marks than most states for their civil forfeiture laws but rank poorly for equitable sharing, at 49th, 39th and 34th, respectively. In January 2015, following The Washington Post investigation and amid mounting criticism of civil forfeiture, then-Attorney General Eric Holder announced a new Department of Justice policy intended to curb equitable sharing, and the Treasury Department followed suit.31 The policy generally prohibits federal agencies from “adopting” cash and property seized by state and local law enforcement for federal forfeiture. However, it created several exceptions. Third, and most important, the DOJ policy specifically exempts seizures by task forces or as part of joint investigations, severely limiting its reach. By the DOJ’s own calculations, over a six-year period, adoptions accounted for just 3 percent of the value of all forfeitures in its system, including those initiated by federal law enforcement.34 Within the equitable sharing program, joint task forces and investigations are responsible for the lion’s share of seizures and revenue. The Institute for Justice found that 73 percent of DOJ equitable sharing seizures from 2000 to 2013 came from joint task forces and investigations, as did 82 percent of equitable sharing payments, as shown in Figure 11. Figure 10 provides an annual breakdown of payments. Following criticism that the policy changes did not go far enough,36 the DOJ in February 2015 offered additional guidance that attempts to limit joint task force and investigative seizures eligible for equitable sharing to those with “federal law enforcement oversight or participation at the time of seizure by state and local law enforcement”(emphasis in original).37 The guidance adds layers of review and offers “factors to consider” in deciding whether a seizure qualifies. However, as Institute for Justice attorney Darpana Sheth has noted, the factors are not requirements, nor are they ranked in order of importance.38 And discretion about whether to accept the seized property for federal forfeiture still “rests with line prosecutors and agency attorneys who stand to benefit from any seizure.”39 Furthermore, the policy does not operate retroactively and does not seem to apply to pending cases. Even if the DOJ’s new policy and guidelines are followed faithfully and maintained by future attorneys general, the potential for abuse remains. Joint task force and investigative seizures are not immune to financial conflicts of interest, as the plight of Charles Clarke illustrates. One of the officers who seized the college student’s cash at the Cincinnati/Northern Kentucky airport was an airport police detective, and the other was an officer of the Covington Police Department serving as a deputized DEA agent.40 Because these officials were part of a joint DEA task force, the new DOJ policy would not apply, even if the seizure had taken place after it was announced. Under equitable sharing, both the airport police and the Covington police stand to gain a cut of Clarke’s cash if it is successfully forfeited. Equally troubling, so do 11 other law enforcement agencies that had no involvement in the seizure. DOJ records indicate that airport police requested 40 percent of the proceeds through equitable sharing, and the Covington Police 3.07 percent.41 The 11 other agencies, including the Cincinnati Police Department, the Kentucky State Police and the Ohio Highway Patrol, requested shares ranging from 3.07 to 6.14 percent. The shares requested by all 13 agencies totaled just under 80 percent, the maximum that can be paid to state and local agencies under equitable sharing. As long as task force seizures are eligible for equitable sharing, regardless of federal involvement or oversight, the risk remains that task force priorities will be skewed toward generating revenue for member agencies instead of enforcing the law. And participation on a task force or a joint investigation with federal agents remains a way for agencies in states with restrictive civil forfeiture laws to generate forfeiture revenue they otherwise could not. Federal and state policymakers have started seeking broader and more lasting reform. In Congress, the FAIR Act would simply abolish equitable sharing.46 Leaders of the U.S. House and Senate Judiciary committees have encouraged the Justice Department to discontinue the equitable sharing program.47 And as part of reforms adopted in 2015, the District of Columbia and New Mexico effectively opted out of the equitable sharing program. Starting October 1, 2018, D.C. law will prohibit law enforcement from seeking federal adoption of locally seized property and direct proceeds from task force or other multijurisdictional seizures to the city’s general fund.48 Similarly, New Mexico now prohibits law enforcement from transferring property worth less than $50,000 to the federal government for forfeiture and directs all proceeds to the state’s general fund.49 Because DOJ guidelines require equitable sharing funds to be spent by law enforcement agencies on law enforcement purposes, these reforms will likely halt equitable sharing with D.C. and New Mexico.